704 s. alvarado st @ 7th st.
i missed langer's on my last jaunt to LA too. i have to admit that i didn't try that hard to get there though. 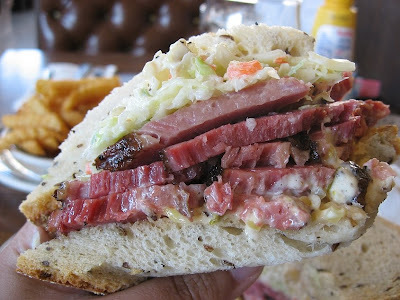 i was highly doubtful that the pastrami there could even come close to rivaling katz's - i'm talking about the one in NY. the one in houston is pure crap. but i had no lunch plans so i drove myself down there. 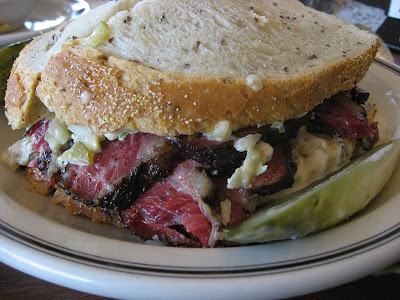 i planned on being a purist and getting the pastrami on rye. 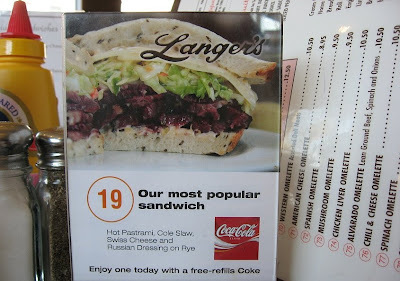 i knew that langer's was famous for their #19, a pastrami sandwich with swiss cheese, coleslaw, and russian dressing on rye but if i hadn't, it wouldn't have been hard to figure out. the #19 was advertised on every table. fresh mayonnaisey coleslaw sounded refreshing so the #19 it was. the rye bread was both soft and crusty. definitely leagues better than katz's. the pastrami was meaty, unctous, and tasty. the coleslaw was cool and satisfying. the cheese was lost amid the other flavours. the homemade pickle offered more cucumber than vinegar flavor which i liked. the close up. not as huge and ridiculously stuffed like katz's but large enough that i only finished half the sandwich. very yummy and definitely almost as good as katz's. i think i missed the sharp mustard that i'm so used to. 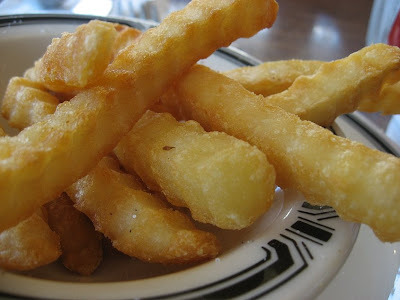 super crispy crinkle fries. they come well done and it was hard to stop eating them. what the joint looked like. pay at the deli where you can also get meats and cheeses to go. 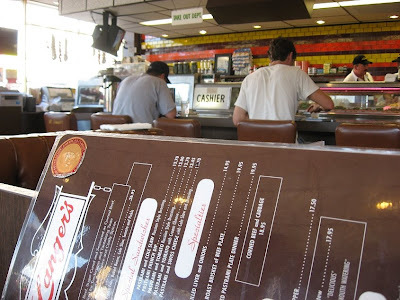 Yes, you MUST go to phillipe's! I had mine with Blue Cheese and a glass of nice red. To die.